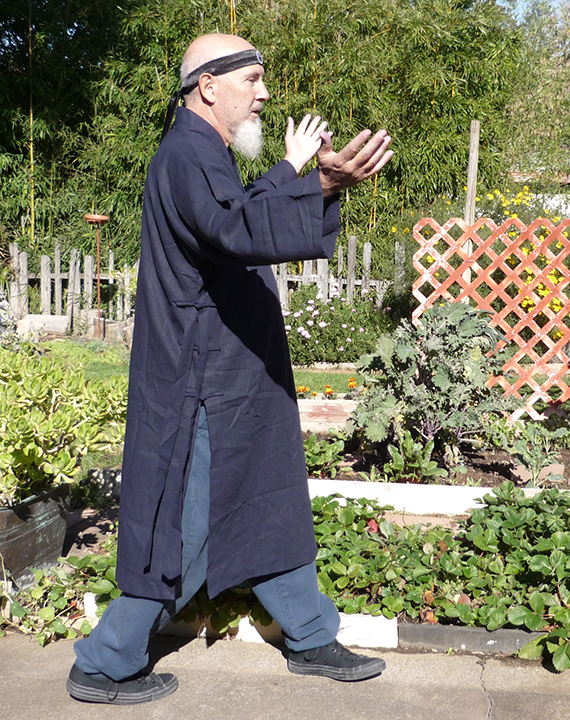 One of my favorite longevity qigong forms is Primordial Wuji Qigong. The form I practice is technically mine in origins, but the philosophy behind it belongs to a long tradition of qigong cultivation. I became interested in it during the early 2000’s. At that time, I was studying the writings of a variety of qigong teachers: Roger Jahnke, Jerry Alan Johnson, Michael Winn, Daniel Reid, Solala Towler, and Ken Cohen. Several of them had written extensively or produced videos on the Primordial qigong. They referred to it in a variety of names: Hunyuan Gong, Primordial Qigong, Hundun Qigong, or “Taiji Hunyuan Nei Gong (Undifferentiated Primordial Inner Work).”  I was mysteriously drawn to it, even though I did not have any direct experience of its form. From the descriptions I read about it, I deduced that it consisted of a lot of circling and spiraling movements. Roger Jahnke described it as a returning and moving in reverse to the natural pattern of things. I started creating my own form, using some of my favorite rolling and spiraling qigong movements, and deepening my understanding of key principles of the Primordial philosophy. At the 2001 National Qigong Association conference in Rhinebeck, N.Y., Omega Institute, just after the 9/11 tragedy, I spoke with Roger Jahnke. I believe it was the Saturday afternoon when we ran into each other outside during the break between workshops. We talked for about fifteen minutes or longer, and spent a fair amount of time on my interests in learning more about Primordial Qigong. He was supportive, however, in directing me to continue developing my own version of it. As much as I can remember now, seven years later, he seemed to be saying that the external form was not nearly as important as the internal transformation of returning to the One – the undifferentiated unity of all things. This last part was not his; I forget the exact words he used. A recent article in “The Empty Vessel” magazine has an in-depth analysis of Primordial Qigong. Ken Cohen, the author of the article, explores the philosophy, the history, the benefits, and the practice of “Hunyuan Qigong.” I particularly like Cohen’s discussion on how Primordial Qigong belongs to the Daoist qigong category because it uses concepts and practices from Daoism. These concepts are key ingredients for the understanding of the internal transformation I referred to earlier. When I talked about the importance of the inner work over the external movements, it was concepts like these that I had in mind. Cohen supports my claim: “External movement is always accompanied by internal movement, and for this reason Primordial Qigong may be considered ‘inner work.’” In fact, a couple years ago, I wrote to Ken Cohen and asked him if he had a video/DVD on Primordial Qigong I could purchase. He wrote back and said he had an old video on it, but it was not an instructional video. It did not explain the internal meditation, which is the heart of the form. Needless to say, I didn’t purchase the video. Before I move onto my explanation of how to practice Primordial Wuji Qigong, I want to highlight another point Cohen made in his article. 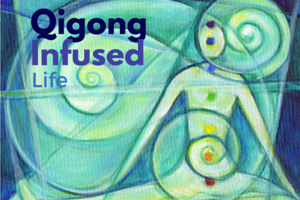 He says, “One of the most interesting aspects of Primordial Qigong is that it can, according to master Feng’s book, strengthen the prenatal primordial qi.” I agree with Cohen on this point completely. It confirms what I have read from other sources that according to a Daoist perspective, our constitutional nature or qi, which we acquire at birth via our parents, ancestors, and even the environment at the time of our birth, can be altered if we “change our relationship to Heaven and Earth. Primordial Wuji Qigong is based on reversing time and returning to the Source, or Dao. It is based in the tradition of Inner Alchemy of cultivating the Five Elements and transmutation of the Three Treasures: vital essence, jing; vital energy, qi; and spirit, shen. 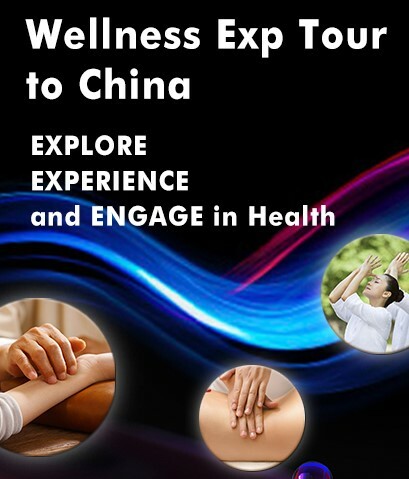 The form combines a deep qigong meditation while moving the body gently. The circulating of the hands is like gathering in of universal life forces. Moving in reverse with the seasons, starting with spring, there is a turning back of time. Energetically, this reversal of time takes you back towards your prenatal original qi – the primordial qi state of pure health, pure spirit, and undifferentiated unity. Furthermore, as you perform this form, you are aware that although you may have health problems on one level of your physical self, on a deeper level, the energetic or spirit level, you know you are already healed, whole, and united in harmony with nature or Original Nature. In this heightened state of illumination, you absorb the primordial energies deep into your body and mind. Your qi meridians and dantian qi fields are filled. Gradually, your focus of healing shifts from the physical to the spiritual. The goal of Primordial Wuji Qigong is to return to the ultimate nature or source of the universe. This may be described as emptiness, or the view that all things are not separate from other things. This ultimate state is beyond intellectual comprehension, and can only be experienced directly. The Buddhists and Daoists describe this state as being already within us, and it is a process of clearing the illusions so we can clearly experience our Original Nature. The ancient Daoists called this Original Nature, the Dao. Those who achieve this level of realization are sages or immortals. The following quote explains this interaction of what is known as the Zuowang View and Method and the Daoist Inner Alchemy tradition. It deals directly with the two traditions of alchemical change processes and the meditative traditions of an original perfected state of being already present within us. “Question to Liu Ming: What about the more ‘active’ practices like alchemical meditation? Isn’t that based on ‘producing an elixir’? 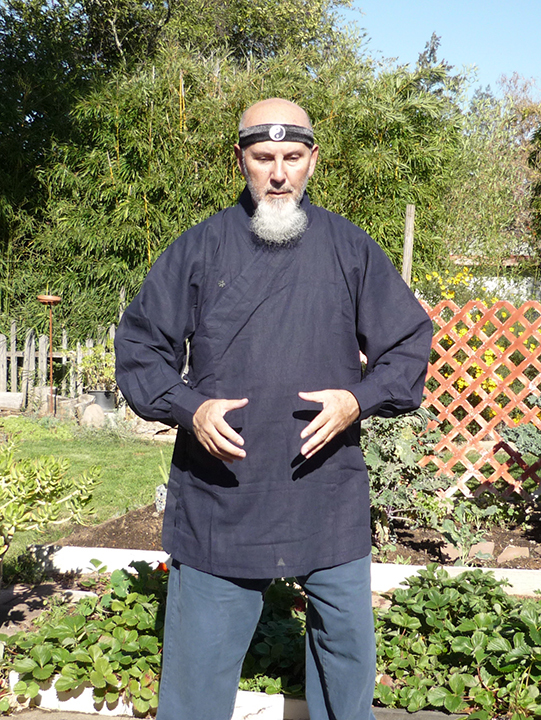 Primordial Wuji Qigong begins by standing still and facing East. Next, start opening and closing your hands in front of your Lower Dantian. Think of the Earth Element and the ground beneath your feet. Gather the Earth energy up from the ground and imagine it flowing into your stomach and spleen organs. Cultivate the qualities of nourishing, supporting, and life giving with the yellow earth energy. Visualize the Yellow Dragon. Expand the open and closing movements to rolling the ball movements. Feel you are pulling in Earth energies and circulating them throughout your body. You now transition to the Wood Element and nourish the organs of the liver and gall bladder, still facing East. Cultivate the spring qualities of new growth, new beginnings, creative energy, and expansion. As you roll the ball, you can turn to your left and feel as if you are gathering the Wood energy from all around you, BUT, especially the East direction. Visualize the Green Dragon. Turn towards the north direction, and focus on gathering in the energies of the Water Element. Cultivate the winter and Water qualities of flowing, fluidity, dormancy and storing. Harmonize the kidneys and bladder with the dark blue and black energies of the Black Tortoise. As you continue to roll the ball, focus on the west direction and the Metal Element. This is the season of the fall, nourishing the lungs and large intestines with the white metal energy. Cultivate the qualities of substance, strength, structure, harvest, hardening and condensing. Visualize the White Tiger. Lastly, turning and rolling to the south, focus on gathering the Fire Element to nourish the heart, the small intestine, the pericardium, and the triple warmer meridian. 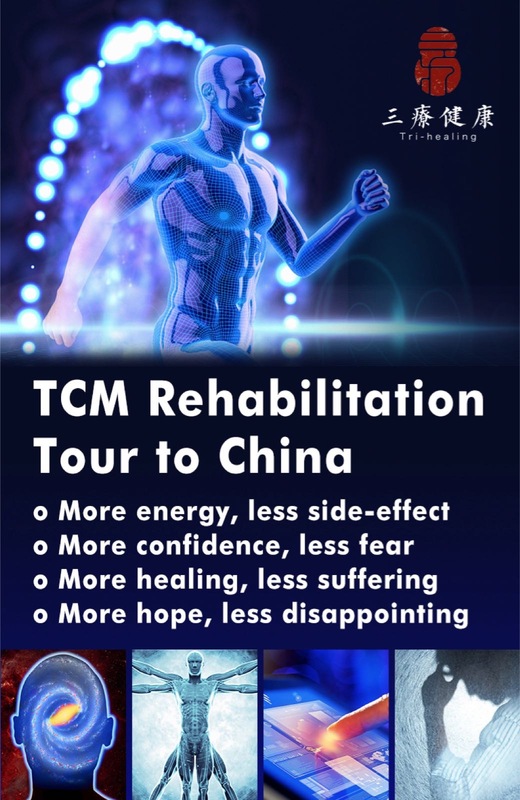 This is the summer season with healing red energy benefiting these organs. Cultivate the qualities of warmth, light, vitality, energy, and luminous and full growth. Visualize the Red Phoenix. Complete the turning and rolling the ball by coming back to the east and standing still, hands on Lower Dantian. Be mindful of all the energies you just gathered in, and allow them to sink deep inside you. Begin this next phase by imagining holding a qi ball in your hands, and moving them up and down in a small circle in front of your waist. The hands move up, close to the body, and away from you, as they descend. Imagine one hand is the yin hand and the other one is the yang hand. They represent all the Five Elements you just gathered, but now simply as the water and fire energies. Think of the earlier quote by Ken Cohen, “fire and water meet,” and realize that you are now blending your own fire and water qualities.You are mixing these two vital ingredients in the cauldron of the Lower Dantian. The water energy, which normally flows downward, you are now raising up, and the fire energy, which normally rises, you are sinking downward. By blending them together, you are cultivating the Three Treasures of jing, qi and shen. Proceeding in this alchemical transformation, you become more and more aware that there are no longer two elements, two things, you are blending; they have become one element, one undifferentiated unity. You finally realize, that is, you wake up to the truth that it was a process of clearing, of forgetting the illusions of separateness. You realize that there was never anything to produce, you just needed to relax, let go, be open as the universe, and accept Primordial Nature as your own Original Nature. The hands come to rest again on the Lower Dantian. Your mind is full of clarity and stillness. In a spontaneous burst of energy, you move into the wuji palms facing heaven qigong movement, turning towards your right. You are now moving in the field of Hundun, the chaos of the universe. Internally, you are in harmony with the universe, and externally, your chaotic, circling movements are in harmony with Chaos. And, as I said earlier in quoting Cohen, Primordial Qigong is blending “the subtle qi of the universe with the denser qi within the body.” There is no effort, no producing at this point. You are manifesting the true state of Wu Wei, naturally doing using no force. Slowly return to facing east. Your movements ease back into opening and closing, and then gradually, just resting the hands on the Lower Dantian, again. At this point, there is very little to say about your experience. You have gathered all the energies of the universe. You blended them all into a unity within you. You played in the field of Hundun. You dissolved into the nothingness of Primordial Oneness. I forget where I found the following description of the dragon and the pearl, but it sums up the whole process of Primordial Qigong. Primordial Qigong is symbolic of the immortal dragon chasing after the pearl of immortality. Once found, the dragon ingests the pearl and lives forever in the immortal realms of Primordial nature, flowing endlessly toward the Source. Hunyuan Qigong: Tracing Life To Its Root, Ken Cohen. 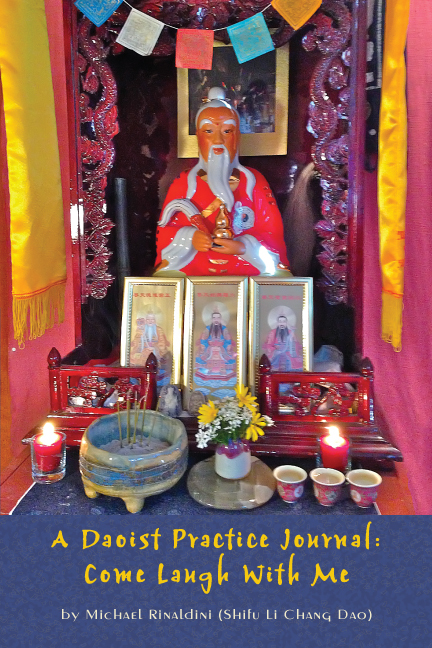 The Empty Vessel: A Journal of Daoist Philosophy and Practice, Winter 2008 pgs. 10-16. 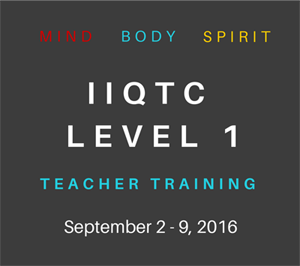 Hi: I am so glad to see the hard and careful work you have put into Hunyuan Qi Gong and this page. I was the first person Grandmaster Cohen taught the form to in a private lesson at his cabin after I gave his daughter a guitar lesson he showed me the first half of the form. He had yet to get the second half from his beautiful teacher Mdm. Gau Fu. I came back a month later and got the rest of the form from him. I used to drive from Los Alamos NM. to study with Ken I treasure the time spent there. I agree the intent is much more important than the external movements. I have seen many distorted stylizations of the simple movements I learned from my friend. I hope you can continue to help people everywhere. My private teachers include. Masters all: Mike Patterson, George Xu, Tim Cartmell, Wong Hao Da, Lu Gway Rong, Henry Look and others. It was Master Cohen that called me ;”A very high level Xing Yi Master”. Simply desire to say your article is as surprising. The clearness in your submit is just cool and that i can suppose you’re an expert on this subject. Well with your permission let me to grasp your RSS feed to keep up to date with impending post. Thank you one million and please carry on the enjoyable work.